Whether it is locking up a motorcycle, securing a gate, or just giving your bicycle a little more security, you will need a padlock. When I talk about the best padlocks, there are several things that I consider. These characteristics are not universal. Like all opinions, this list is subjective. The characteristics I care about are forced entry resistance, pick resistance, value, and versatility. The numbering is as reasoned as preference can be, based on those four criteria. Ranking will depend on the balance of those aspects. 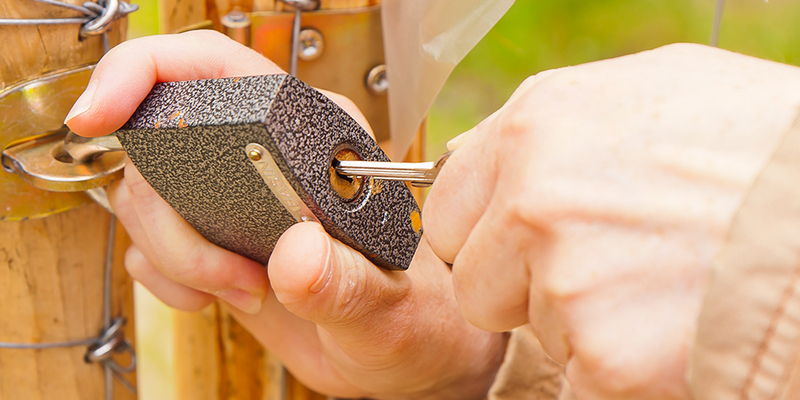 It is important to remember that there is no such thing as unpickable locks. All that these devices will give you is time. The amount of time it takes a criminal to overcome your security is the only purchasable protection that exists. The time you get will depend on the type of attack. Depending on the types of threats in your particular area, or line of work, some locks may work better. Depending on your economic conditions value might be your most important factor. Though value is important, in the security industry, you are going to get what you pay for. The Stanley has edged its way onto this list. It is a good start for a fair price, and the lock has a changeable core, so it is easy to upgrade. The price comes in under $50, and for that you get a Schlage high security six pin core with counter milling and some security driver pins. It has a shrouded shackle and anti drill plates with a hardened steel body and shackle. Pretty amazing for a relatively generic and widely accessible lock. Again not the best, but it is entitled to the number nine spot just because it has pretty much no competition for what it is. You can get it repinned or simply change out the core with something a little more high security. Ironically enough, Best was able to get on this list. But this decision is not based on exceedingly clever wordplay, this lock has earned its spot. Seven pins and a master key system make them a the choice lock for many industrial companies. It also has a very severe paracentric keyway that severely restricts access. 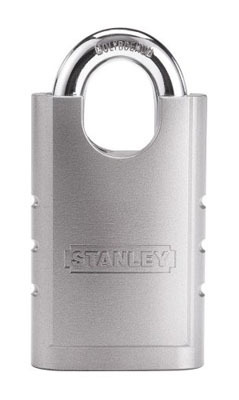 The lock also has changeable cores in case you feel more secure with another brand’s cylinder. The core can be removed with a change key that takes advantage of the lock’s two shear lines, so replacing the core is as fast and simple as turning a key. This is also ideal if the core is damaged. The shackle is very strong to stand up to destructive entry. A shroud can also be added for additional protection, and it is the only model with this feature. This particular Medeco has a shroud comprised of hardened steel that protects a hardened steel shackle. The core is the latest M3 model. There are some discovered weaknesses with these cores, but it takes quite a bit of knowledge and understanding about the company and experience with lock picking, to overcome them. The more alarming of the weaknesses have been addressed in all locks manufactured after 2011. They are not as resistant to covert attacks as people think, but they still provide an immense amount of security. That name being on the lock is enough, in most cases, for a thief to give up on any thought of picking it. The reason the lock is so low on the list is that the body is made of brass. That leaves the lock body as the most vulnerable part. Other than that it is very versatile. It is designed to be very resistant to weathering and outdoor conditions. You are paying more for the brand name, but with it, you get a high-quality padlock that will stand up to traveling and industrial environments. The brass body is also covered by weathering protection so that the weakness is hidden. To most it is going to look like a lock that they cannot pick with a big thick alloy steel shackle covered by a cast iron shroud. Not really the illusion of security, but a sterner implication of it. And I am being pretty critical because this is a list of the best padlocks of all time. Truthfully it is a very secure lock. It is known as the insurance lock and it even has this message on the lock body. Its name is no cute gimmick or marketing strategy either. It is the minimum level of protection that insurance companies will accept to insure property based on Swedish insurance standards. The Granit will provide a great level of protection, but it does have several models. The price will vary depending on body and shackle size, but it gives the option of getting a shrouded shackle. The lock is made in Germany and depending on where you look on their website you may be informed that the lock has a tensile strength of over 6 tons or that it is over 6 tonnes. This is not a spelling error. A tonne is a metric ton, which is just below the weight a standard ton. Therefore, if it can withstand over 6 tons, then it is can definitely hold together with over 6 tonnes of tensile pressure. The core is extremely pick resistant and uses disk detainers instead of pin tumblers. This means that the key will run through the disks in the lock rotating them to the proper angle, which allows a sidebar to drop into place. To pick these, you need to feel the sidebar fall into the gaps on the disks. With well-made disk detainers, such as the Granit, the feedback is almost nonexistent. 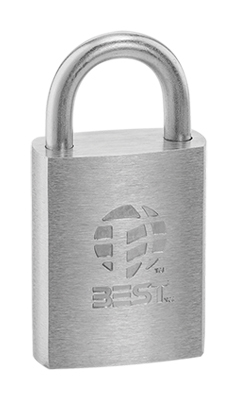 With its pick resistance, acclaim, an array of prices, style options, and high tensile resistance it is a strong competitor for the best padlock. Mul-T-Lock’s #13 C series is a tour de force of protection. The MT5 plus core is exactly what it sounds like, an addition to the MT5 levels of protection. The specific add-on is a set of sliders. The sliders are laser cuts on the side of the key that work in conjunction with the dimple cuts on both sides of the key to make the cylinder pick resistant. And the active element (alpha spring) in the key prevents unauthorized duplication. It is a lot to get through in order to pick this lock. Unlike other so-called improvements to extend the patents for other keys, the sliders do not pose a threat the security of this new cylinder. If the sliders were to be compromised, the lock would still need to be picked. There is also a shutter to keep you from picking the cylinder while it is in the lock. Just the core alone might be able to be picked, but in the lock body it puts up quite a fight just to access the pins. That same shield over the keyway also helps with anti drill protection. The steel body and solid steel shroud should also discourage any person that gets tired of trying to pick the lock. 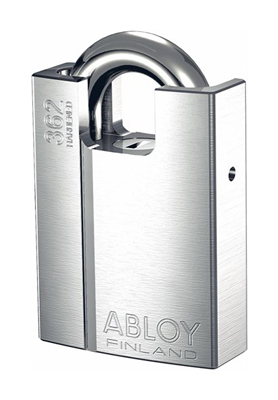 At around $180 it rests below the Abloy PL362 and just above the shrouded Abus Granit. It is at this point that the cost starts to rise quite a bit between levels of security. This is an extremely impressive lock. It has a disk detainer system with over two billion possible key combinations. The lock has not been picked or overcome while inside the padlock (deadbolts and removed cores have been picked or forced open). The keyway is recessed into the lock body which adds further complications to picking. 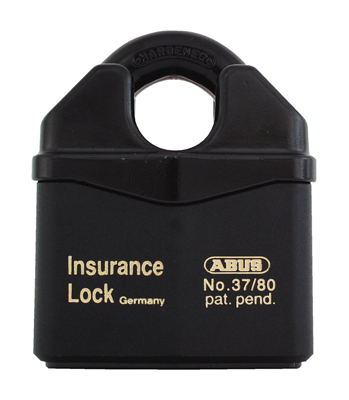 This model is one of the largest padlocks available on the market, and it is a fortress of a lock. 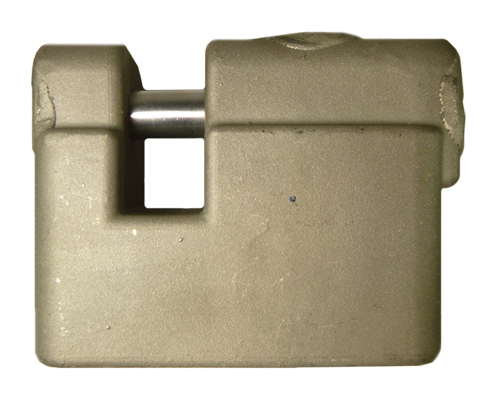 The lock body is made of hardened steel and the shackle is a Boron Steel alloy. The body is harder than most drill bits providing a the anti drill protection, and a defense against attacks to the body of the lock. The shackle is even more secure than the body, and it is further protected by the hardened steel shroud. There is not much to say on the negative end. It is around $270 new, but you get a very good value for your investment. Evva is a truly spectacular company and there MCS cylinder has still yet to be picked. 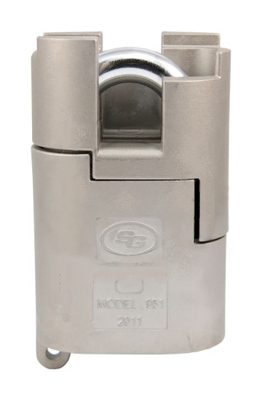 The MCS uses a magnetic key system to move magnetic pins around on the inside of the lock. It also has a biting on the key that move standard pins. Decoding efforts have only been successful with the functioning key. And now all that protection is available even if you are securing your bags while traveling. The lock body is made of a composite alloy. The shackle is made of a hardened steel alloy and it is further protected by a shroud. 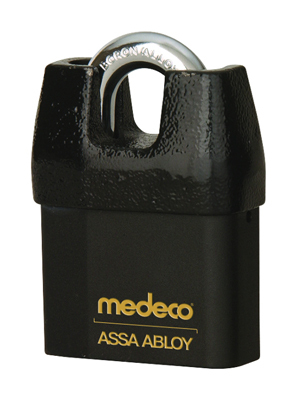 This comes in around the same price as the Abloy, but it edges it out due to the use of magnets. It is just such an intensely complex internal system that I believe has a hair more of a chance of sending away a criminal before they even try to open the lock. High shear has only made one padlock and this is it. It comes standard with a Medeco core just so picking is not easy. From there the keyway is very restricted. This is another instance of a lock that can be picked much easier with the cylinder removed from the lock body. It can be picked, and such a thing has been documented. However, that cylinder can be replaced or the pins can be exchanged. So the real focus falls on the protection of the lock body. This is a very solid lock. It weighs around 5 pounds, and it is big. The lock is used by the military and that shines through in the utilitarian design. 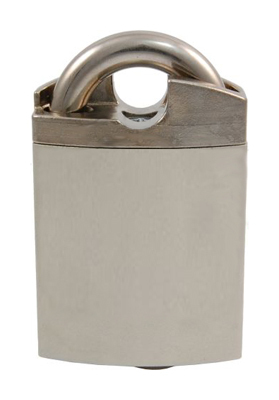 The shackle is a straight bar, which is often called a shutter style padlock. The shutter gives the same level of protection as a shroud would, because there is still a very small amount of space available to cut on the exposed shackle. These things show up every once and awhile online, but they are not widely available. On eBay, you can pick one up with no keys for somewhere around $50 to $100 and asking prices for the lock and accessories hover on either side of $300. But if you have no keys, you can still make new keys on a key cutter with just the lock. 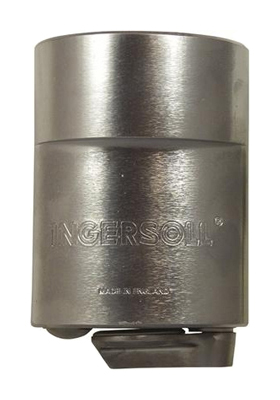 The 700 series of Ingersoll padlocks uses the self-branded ‘Impregnable’ lock core. The core uses a lever locking system with ten levers. However, this lock is not using a run of the mill lever and fence design. In fact, the key looks more like a car key (doubles sided wafer, not a slider key) than it does a padlock key. This design is an improvement on the similar OS600 model, which only uses six-levers. These locks are shrouded in an almost complete circle, to the point where the shackle is almost impossible to see. Add to that, the shackle is ‘full release’. That means if a thief wants to break it open, they will need to make two cuts and take the chain out from between the gap. Amazon sells them for the low price of $255.74 plus more than $30 in shipping. They are also available by many European distributors, but you will have to calculate your conversion rate. This is a heavy duty padlock. A steel brick of security. Between the lockbody that is a hunk of uninterupted metal forming into the shackle, and the ‘Impregnable’ 10 lever core. This is a padlock that gives your property the security it deserves. The retail price for the S&G 951 is $2,537.92. In all fairness, it seems to sell for about half of that (around $1,500). It is very secure and comes with an interchangeable core. If you are unhappy with the Medeco core that comes standard with the product, you can upgrade to a different cylinder. It is made to be easy to maintain, take apart, and service because of its military use. With military usage (and that price), you also get military level security. It is a big heavy lock “…made up of proprietary alloys in the padlock body and shackle that give it extreme resistance to physical attacks”. There are also ceramic inserts that are resistant to cutting attacks, and an anti drill shield that turns to deny the drill any bite. The shield also has three hardened steel pins that should deflect a drill bit if it were able to begin boring into the metal. The shackle, which is about a half an inch thick (12mm), is also heavily shrouded. There is just no other lock that offers these levels and layers of security. The price does make it exclusive, but you are getting what you pay for. The one and only review on amazon is from a verified buyer that simply reads, “Good”. Five stars. When a fact about your product seems like a Most Interesting Man in the World commercial you know you have something special. But I disagree with this man. He says, “Good”. I say, “Best”. Shackle – Without ball bearings, the shackle can be shimmed. Because shimming is such a well-known padlock bypass, anything that doesn’t have ball bearings cannot be considered high security. To avoid needless redundancy, I will just say it here, that all of these padlocks have ball bearings. How the shackle releases can also give further security. If one end releases and the shackle swivels on the other end, then only one side would need to be cut. A shackle that releases on both ends needs two cuts. Each cut buys time. Shroud – This protection has many different names, but the most apt is, perhaps, shackle cover. Any metal that covers, or shrouds, the shackle adds an additional layer of metal. That layer will need to be cut, or otherwise removed, in order to open the lock. The less of the shackle that is accessible, the more protection you have. Core – This part of the lock is where the key is inserted (also known as the cylinder). The core of the lock is going to be where you get your pick protection. Important factors are: What type of pins does the lock have? Are the pins standard, hardened steel, or security? If the lock has security pins, are there spools, serrated, pin in pin, etc? How many pins are there? Does it even have pins? It may be a disk detainer lock, or something else. Not everything is a pin tumbler. If the core is removable then you can customize it further, or replace it for something else. Other security measures that a lock might have side bars, active elements, counter milling, etc. Anti Drill Plate – This addition is meant to prevent the drill bit from biting into the metal. This can be accomplished a variety of ways. Often a loose cover is used so that it can spin independently from the lock. By spinning freely, the rotation of the drill will only spin the plate and not catch in the metal. The plate may also have hardened steel inserts, or be made of hardened steel, in hopes of deflecting the drill bit or being harder than the drill bit’s metal. Metal – The better the metal, the better the security. This rule is true for the lock body and the shackle. Thickness and metal type will be the most important factors. Specialized alloy metal is better than standard hardened steel (which is still technically an alloy). A thicker piece of that alloy metal is even better. In most locks, you can actually feel the difference. The weight of the device is often (not always) an indication of the strength. There is quite a steep range of prices in this list. Everything from under $50 to over $1,000. Even in the cheaper locks there is the potential to increase the security by spending more money. From here I would suggest that you do further research to find out what the best padlock is for your needs. Take into account what you are securing; where you are securing it; how long will it be unsupervised; etc. There are always limits to what the lock can do for your security. A lock is only as strong as the weakest link. The key to making your lock matter is having great security in every other regard. If the largest flaw in your security is an amazingly well-constructed padlock, then you are probably as close as you can get to perfect security. The padlock is just an aspect, but every aspect of your safety matters. This is my list. Share your own in the comments below.